The 6th China Shanghai International Children's Book Fair was held in Shanghai during November 9 to 11, during which the launch ceremony for promoting a collection of translated award-winning works by Xue Tao was successfully hosted by China Translation and Publishing House (CTC). 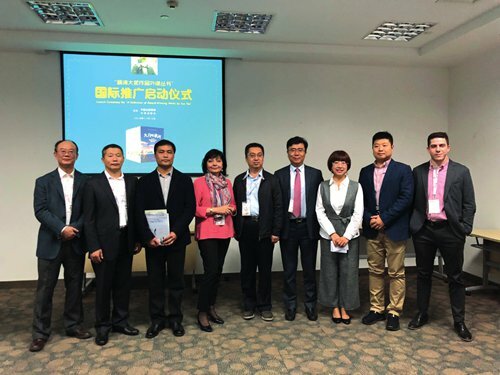 Li Yan, vice president of China Publishing Group Corporation (CPGC), gave a speech saying that CPGC has made great efforts to disseminate excellent Chinese literature to the world. They encourage diversified and multi-dimensional exploitation of good Chinese children's literature, and are devoted to creating a new mode of publishing through media convergence. Xue Tao who represents the fifth generation of Chinese children's literature writers, has won many awards both in China and overseas. His stories have appeared in Chinese textbooks and have also been published in other countries such as Japan, the US, Vietnam and South Korea. This collection of translated award-winning stories including Little City, Botanical Garden at High Noon, Manshan's Fight towards Japanese, will be translated into English by senior translators, and will be published in ebook and audiobook formats. CPGC will also seek opportunities to export the writer's copyrights of this collection in other languages to more countries and regions.